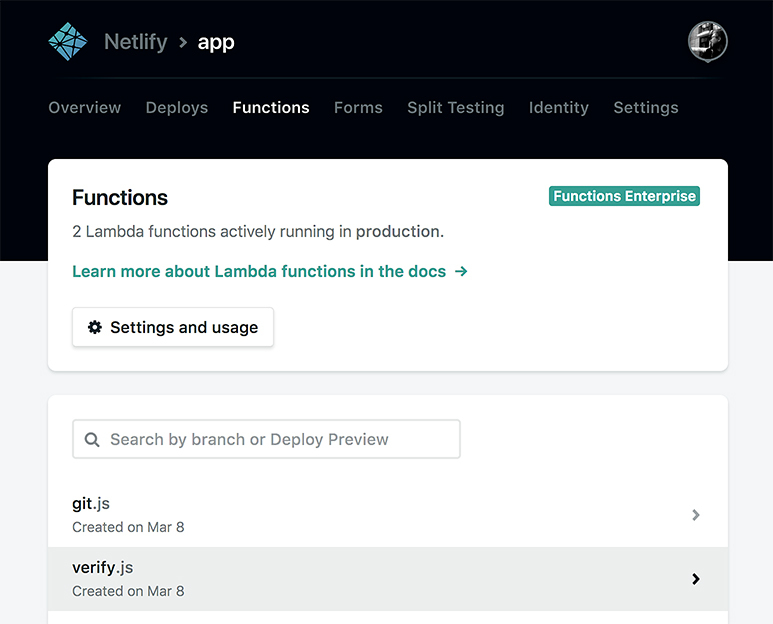 Netlify, the spunky startup built around git-centric workflow, is pushing the envelope once again with the release of Netlify Functions, a tool that makes the deployment of AWS Lambda functions as effortless as adding a file to a project’s Git repository. Functions was created to knit together cloud-native microservices and API-driven tools on the back end in an intuitive, front end-friendly way. Netlify decided to focus on AWS Lambda because, he said, they wanted to support an existing system. Bach implemented a quick Functions prototype for internal use and realized, in the process, that this was, in fact, an essential service lacking in the marketplace. “It didn’t take very long to get it together, actually,” Bach said. “What took longer was building the mental model. How it could fit into our service, how to make immutable Lambda that could fit in with API gateways.” By October 2017 Netlify Functions was in beta testing, and at work in real life projects for the company — as well some Netlify clients. Smashing Magazine was one of the first to try Functions, according to Matt Biilmann, Netlify’s CEO and other co-founder. “It’s a complex use case — they lean on Stripe’s API for subscription payment processing, Mail Chimp’s API for marketing and communicating, along with multiple other cloud-based service providers — but they also needed a little bit of glue to tie their microservices together with our platform,” Biilmann said. Netlify Functions at work in the dashboard. There’s not much more to show, TBH, because the feature is so baked-in and simple. So in true Netlify fashion, Functions has transformed a previously complicated, even daunting, setup process… by simply adding a function to a folder in a project’s Git repository. Netlify will automatically recognize the function and deploy it along with the rest of the site. Just another folder in your project’s git repository pushed from the command line and instantly live (but with complete rollbacks): apparently, the market was more than ready. Netlify Functions is not the complete developer’s fantasy in that it doesn’t supply the actual code — we devs still need to create the AWS Lambda functions themselves, the way we supply Netlify with the client side code. With Functions, Netlify now makes it just as easy to provide dynamic site functionality as it is to spin up a static site through their service: build it, then push from your git repo of choice. This means devs without a lot of back end experience can now deploy also Lambda functions. Without the need to interact with AWS’s less than friendly UI, struggling to configure API gateways or coordinate deployments. (Actually, you don’t even need to set up an AWS account at all — Netlify even handles that piece, too). Along with the public release of Functions beta, Netlify is also releasing its Identity and Forms service out of beta — two more offerings aimed at easing developers’ entry into the JAMstack ecosystem. Netlify Forms is a utility for managing forms and other site submissions — and is dead easy to use. Simply add a netlify attribute to any HTML <form> tag in your site markup, and submissions will be delivered to your Netlify dashboard — whereupon you’ll receive notifications, plus be able to trigger webhooks and redirect submission content to your heart’s content. Access to all of these features is part of the Netlify platform. Signing up with Netlify takes less than a minute, and you can link your GitHub, GitLab or BitBucket identity instantly. Pricing is tiered, and everything starts out as free. Once a project’s usage exceeds the free tier’s limits, there is a “metered” pricing system that only charges for what is used. “We do something we really love, and we want to make the JAMstack as accessible as possible for developers,” said Biilmann. Building these new workflows is essential in part, he added, because the front end developer’s role is rapidly changing. And, he concluded, Netlify hopes to meet them there, providing that “glue layer” for fitting all the pieces together.